The United Nations was established on October 24th, 1945. Only Warring “Allied” nations qualified to join the United Nations in the beginning, and some nations declared war (to be in a state of belligerency) after the meeting solidifying the formation of the UN just to be able to join. Germany surrendered to the “United Nations” on May 9th, 1945 -and was made retroactive to May 8th- months before the United Nations was officially established. The United States deposited their ratification of the United Nations Charter on August 8th, 1945. Japan surrendered to the “United Nations” on September 2nd, 1945 for dissolution, making it the Second unofficial member of the United Nations- before establishment on October 24th, 1945. The US and other nations’ ratifications could only be recognized in the UN after the UNs establishment, but Germany and Japan officially recognized the United Nations before the UN’s official establishment- via unconditional surrender. The United Nations replaced the League of Nations (LoN) because the LoN was found to be morally and organizationally bankrupt in preventing war. 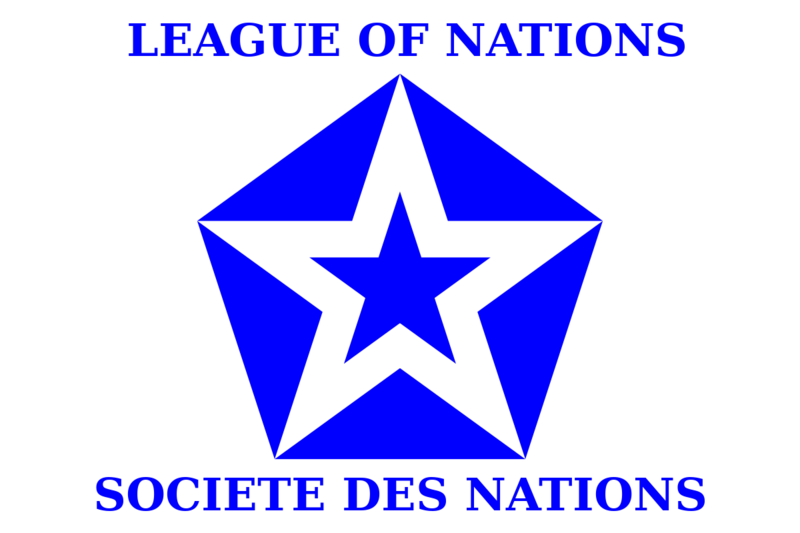 The League of Nations was officially dissolved and assets returned to the former member countries. The League of Nations Receivership authority appears to have been transferred to the United Nations; and the UN seems to be the League of Nations operating in bankruptcy receivership. The United Nations has multiple complexes around the world, such as a Headquarters in the old League of Nations “Palace of Nations” Headquarters. 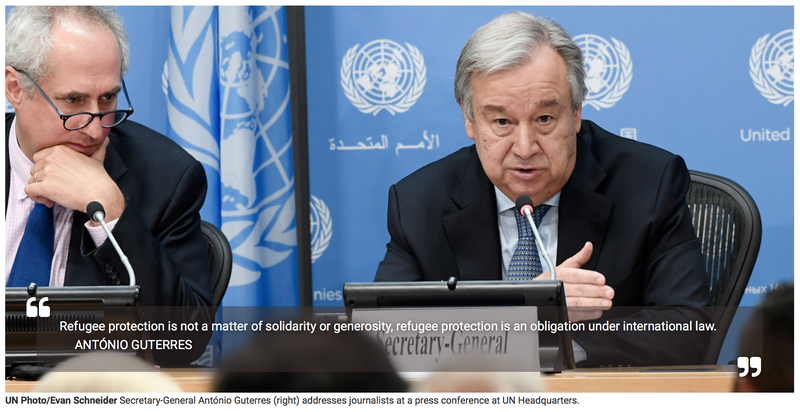 The United Nations requires all joining Nations to be operating in Bankruptcy Receivership and to SURRENDER (a term of war) the Trusteeship to the United Nations. The Head of the United Nations is titled the SECRET/ARY-GENERAL- A General is a military position that keeps secrets. All UN Member-Nations have entirely LOST their sovereignty to the United Nations and are merely operating (as executors) the “national Trust” Franchise set up to look like a “nation” which is called “the Public” by [fictitious] attorneys. The United nations is the single global issuer of “legal presences” (which are artificial persons/strawman) for all UN Member-Nations and requires the “UN Member-Nation” to Surrender (term of war) the Birth Certificate to the United Nations to be able to access its “CITIZENS” legal presences from the UN. The United Nations grants totally immunity for the operations, execution, and performance of their UN Member-Nation Franchise. This is also encoded in US law as the Foreign Sovereign Immunities Act and affirmed by Kidane v. Ethiopia. We cannot take any attorneys to court for being attorneys and operating the fictional legal system franchises authorized by the United Nations. The United Nations has outlawed Justice across the globe; only the United Nations is allowed to “dispense” justice and has resulted in all courtrooms globally being replaced by UN Competent National Tribunals. UN Competent National Tribunals are not required to abide by any National Laws and are all extra-territorial courtrooms in the appearance of “justice” but not actual justice. The United Nations grants its “UN Member-Nation” franchises the “sovereign right” to control all “Citizens” legal presences and all Human Being Nationals. This has led to every UN Member-Nation being and acting like an open air prison. Pets are CONTRABAND -and may be murdered by corporate policy enforcers- unless they are “UN Member-Nation licensed”; and thus owned by the UNITED NATIONS. Contraband only applies to CORPORATE PRISON SYSTEMS. The Highest Law of the Land is the United Nations Universal Declaration of Human Rights (UN-UDHR) and it supersedes all national constitutions, national laws and codes, and every nation. The UN-UDHR is/was imposed as a Corporate Legal Franchise OVERLAY via the Power of Assumption by the UN. Assumption is a Legal “power” that allows the Executor (usually the “UN Member-Nation”) to operating under any assumptions they want to impose without having to provide any evidence of the assumptions actual truth and accuracy. It makes the “UN Member-Nation” into an Open Air Prison System Franchise. 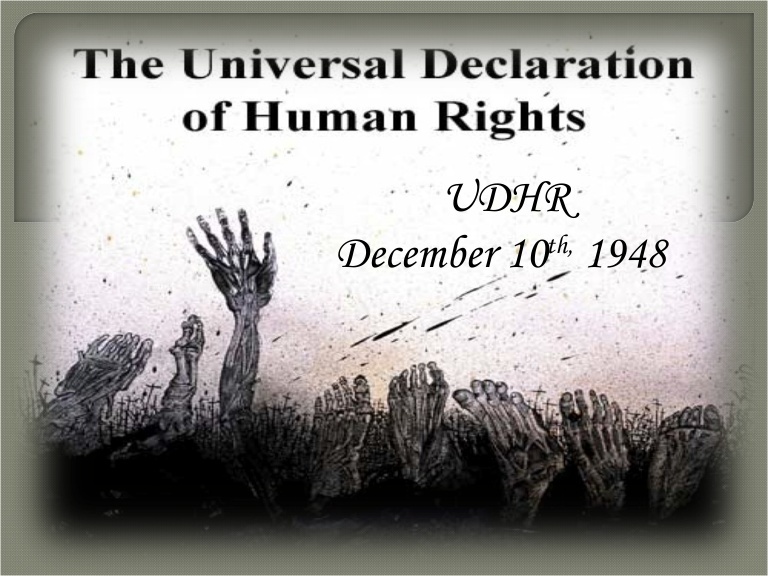 The UN-UDHR allows the United Nations to en/title and Underwrite (with IMF debt) all human rights merely for claiming to be a human being and/or to have/exercise any human rights. Our Human Body and Human Rights are the value/surety backing the fictional legal franchises. The Land for the United Nations buildings was donated by the John D. Rockefeller Jr. The Treaty between the United Nations and the United States from June 26th, 1947 -that headquarters the United Nations in New York City– granted the whole of the CITY OF NEW YORK to the United Nations, along with radio facilities and an airport. The City of New York is its own Sovereign City-State just like the Vatican City, City of London, City of Washington, and CERN. The John F. Kennedy Airport was opened in 1948 in accordance with the United Nations Treaty with the United States in #25. Title 22 U.S.C. §4309a (e) United States responsibilities for employees of the United Nations provides that the US Secretary of State defines the “UNITED NATIONS HEADQUARTERS DISTRICT” but refuses to clarify the operational definition. 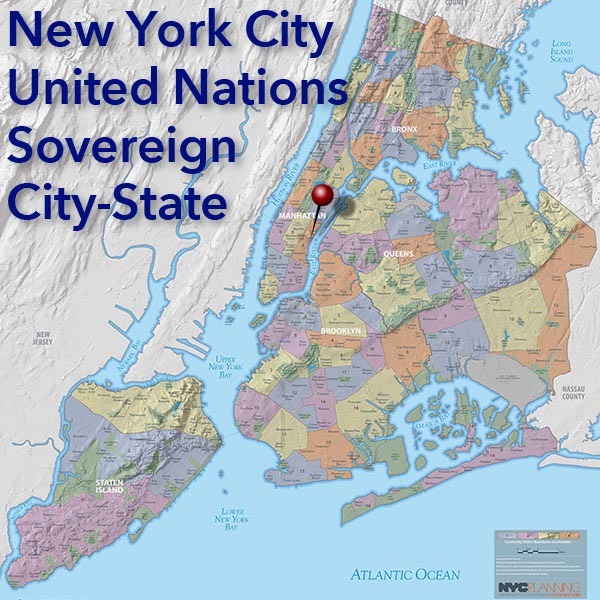 The UN Headquarters District seems to be all of the City of New York: Manhattan, Bronx, Queens, Brooklyn, Staten Island, and U Thant Island. Resident born in a Federal Zone -such as City of Washington, Guam, Virgin Islands, Puerto Rico, etc- are NOT eligible for US Presidency because the operational Incorporated “UNITED STATES” is only the 50 incorporated states. 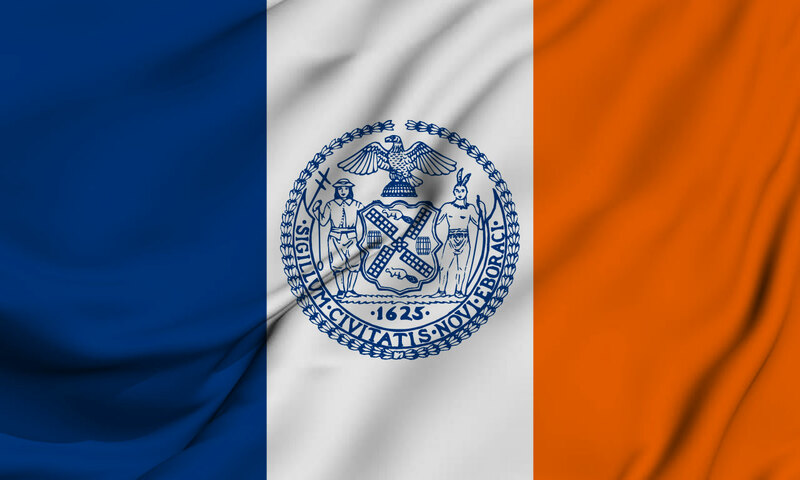 The City of New York issues their own Birth Certificates and Vehicle Titles separate from that of the STATE OF NEW YORK, just like the City of Washington, City of London, and the Vatican City. 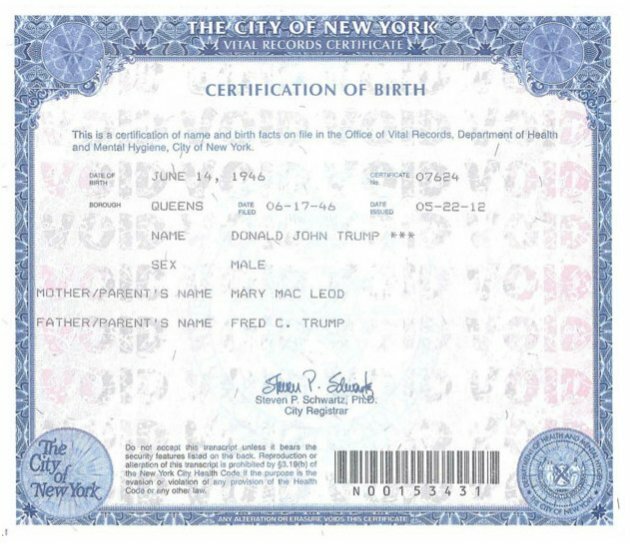 DONALD J. TRUMP’s City of New York Birth Certificate is not related to the State of New York in any way. making him ineligible to be President of the United States as the CITY OF NEW YORK is not a land territory of the United States. There is no stipulation in the SECOND INCORPORATED US Constitution (from 1871) (nor Statutory Constitution overlay of 1933) for non-US Citizens to be President. All the Major Banks are incorporated in the CITY OF NEW YORK making them totally immune to all US Laws and Codes, particularly regarding banking. This is why New York City bankers don’t get charged with obvious crimes. The City of London allows banks to rehypothecate (sell, resell, re-resell, etc) assets an infinite number of times. The same one ounce of Gold/silver/anything may be sold a million+ times in the City of London. It is suspected that the CITY OF NEW YORK has no rehypothecation limits either. The United Nations may subcontract all security services from the United States and thus the Policy Enforcers in the City of New York appear to abide by US laws because they are still beholden to those laws, but US Laws do not apply to City of New York Residents, except by legal fictional non-sense. The CITY OF NEW YORK POLICE DEPARTMENT has the largest Police intelligence agencies “in the US” because they are not US-based. The Former Mayor of the City of New York Rudolph Giuliani stated, “New York City is the Center of the World” because it is. The IMF issues all the Debt for all UN Member-nations and underwrites all “Birth Certificates” as “Bank Notes” due to the fact that Birth Certificates are “Negotiable Instruments” and financial securities traded on the stock market. Most Birth Certificates globally end up in the Depository Trust and Clearing Corporation (DTCC) vaults in the basement of 55 Water Street, City of New York. Hurricane Sandy storm surge had risen so much that it went into the basement vaults of the DTCC and destroyed $36.5 trillion of Birth “Stock” Certificates. The event was a windfall for UN Member-Nations who issued all new Birth Certificates after Hurricane Sandy so-as to re-capture and “re-parasite” the energies of humanity with more new debt. 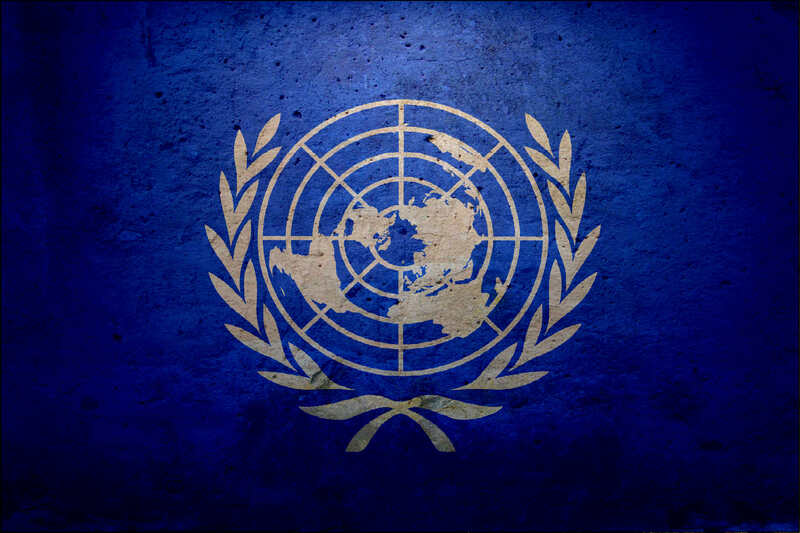 The United Nations was created to stop war; however once war would be stopped, the United Nations would cease to exist; So… Attorneys devised a way of making World War 2 perpetual through the United Nations. Just as the 1871 US Constitution – Thirteenth Amendment abolished slavery by making slavery the default modus operandi of the US with “Federal Citizens,” the United Nations abolished World War 2 by making World War 2 the default mode of operation for all “UN Member-Nations” against all humanity. Every Human Being is an “enemy combatant” to the United Nations and is treated a surety thus property of the United Nations. The Birth Certificate is an ownership document, the UN owns humanity by issuing Birth Certificate Fictitious Negotiable Instruments. The United Nations is the “master” of all Attorneys globally, as proven by Michigan Prosecuting Attorney P-25745 stating, “Well, I’ll have to talk to my masters at the United Nations about that”; regarding the non-legal lawful land jurisdiction and the legal authority that he was trying to assume over it. The United Nations is the Franchiser of all Franchises- such as the Franchiser of Legal Presences, the Franchiser of the Debt as Money Ponzi Scheme, the Franchiser of Legal Systems, and The Franchiser of Nations. The United Nations particularly underwrites Education, Marriage, and Children as negotiable instruments to be owned by the UN. The University of Michigan stated that prior to the Digitalization of University Identity Records in 2001, the university issued “birth certificate like documents” from which the Student ID and Employee ID numbers originate. All Universities issue Identity Papers as Negotiable Instruments -recorded in the Registrar’s Office- that are underwritten by the Financial Department with new debt as line items via the IMF. All education is totally unequivocally pre-paid by the United Nations IMF- so are children (and their entire life, all their property, all their rights, everything). The United Nations IMF owns the LAWS AND CODES of CERN, the 5th City-State operating the Science Franchise. CERN plans to build a new super collider called the Future Circular Collider with energies up to 40,000 TeV able to collapse the dimension of time… with the purpose to achieve a time resonance allowing for exponentially higher energies than that. 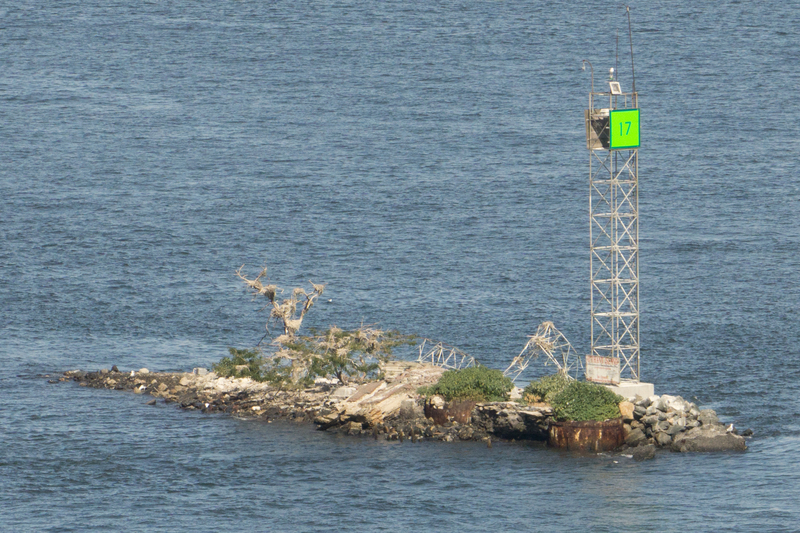 U Thant Island was created from the excavation of road tunnels. Named after Secretary General U Thant, it is the only original LAND that the United Nations likely actually “owns” and gives it authority and jurisdiction to “exist”… as operating from U Thant Island. It is a Protected Wild-life preserve area and likely the only true land jurisdiction of the United Nations. The United Nations is authorized by the Vatican to operate the Third Papel Crown- The Crown of the Ecclesiastical See. The United Nations is the One World Government that George H. W. Bush was talking about in 1990. The UN had already been established decades before Bush’s speech about the New World Order. The speech was a diversionary tactic. City of New York Flag usurped into the UN City to make it appear as if there wasn’t a change-over. The United Nations has attempted to usurp the History of New York City as its own -such as its flag- to seem as if there wasn’t a change-over rather than document the new Corporation -as its own NEW thing without history- operating the Land. Humanity cannot be restored to fullness without ending the United Nations and its continued perpetuation of World War 2 for its own debt “profit, gain, and control” at the expense of All Humanity. The full “Global Coordinated Reset” must end the United Nations. The UN’s end is inevitable; its only function is/was the perpetuation of World War 2 through the franchising and overlay of “legal presences” within their “UN Member-Nations.” All “UN Member-Nations” must be dissolved likewise. 56. The United Nations issues, backs, and underwrites all Military and Corporate Legal Presences making every Military into the UN’s Military. That’s how they “control peace”; by issuing DEBT Financial SECURITIES that represent the “rights” and obligations of the UN Member-Nations and its “legal presences”/People. The Secret Space Programs are all authorized and made fictionally “legally present” by the United Nations. P.S. Everything LEGAL is a MERE FICTION, by corporate “law”/legalisms.